In following this main goal, Ordyx staff realizes and understands that in order for restaurateurs to increase their efficiency they need to focus their time in running the restaurant and servicing their guests, not in managing a traditional "in the restaurant" back office. On a traditional POS product the back office resides on a computer within the restaurant. As a result, that computer needs to be maintained by restaurateurs in terms of backups, memory needs, hardware failures, etc. In order to eliminate that burden from restaurateurs, Ordyx works with its Internet based Ordyx server which resides outside of the restaurant. Every touchscreen inside the restaurant is continuously synchronized with the Ordyx server using the highest standards of encryption available today. The touchscreen not only synchronizes in terms of menu changes, but it even updates itself automatically with new versions of the software, thus eliminating the need for having to pay for upgrades. 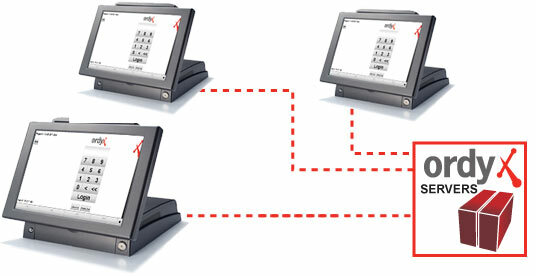 Even in the seldom case that the restaurant gets temporarily disconnected from the Internet, the Ordyx software is designed so that touchscreens are able to detect this event, maintain all information locally, and automatically synchronize with the Ordyx server once the Internet connection is reestablished. Furthermore, the offsite Ordyx server allows Ordyx support staff to run daily backups as well as provide a higher level of service than that provided by POS products dependent on local servers. From anywhere in the world restaurateurs can securely and confidentially see everything happening in the restaurant from the current orders being taken to the latest inventory levels.